tikal, his brethren, the knuckles/nocturnus clans, serving the greater good and seeing mobians having peaceful lands, dislikes regulus's descendants leo or moonlight, argus his former master and dr. lyric and nebula for trying to use him. one of two chosen heroes for the world of mobius 4000 years ago when a fallen god named argus (similar to enerjak but isnt an echidna suped up on chaos energy) began to rule over mobian with a great fist and with many powerless to stop him the goddess aurora sent her seven chosen guardians to locate a chosen hero who could unite all of mobius to fight against her fallen brother and free the world from his darkness. and in their search they found two a lone farm boy named regulus and a prince of the nocturnus clan named noctis. after careful study of the two and with the proper training the two could become the hero the goddess was looking for. so they meaning the seven celestial generals devised a test to see which would be worthy of becoming the goddess's chosen warrior. having to test them both in speed, skills, combat, and strategy all of which noctis excelled at very well given his dna over regulus. but one thing that noctis didn't have over Regulus was the heart of a leader. one who was kind gentle, sweet and very trust worthy who could untie the people of mobius against the fallen god. 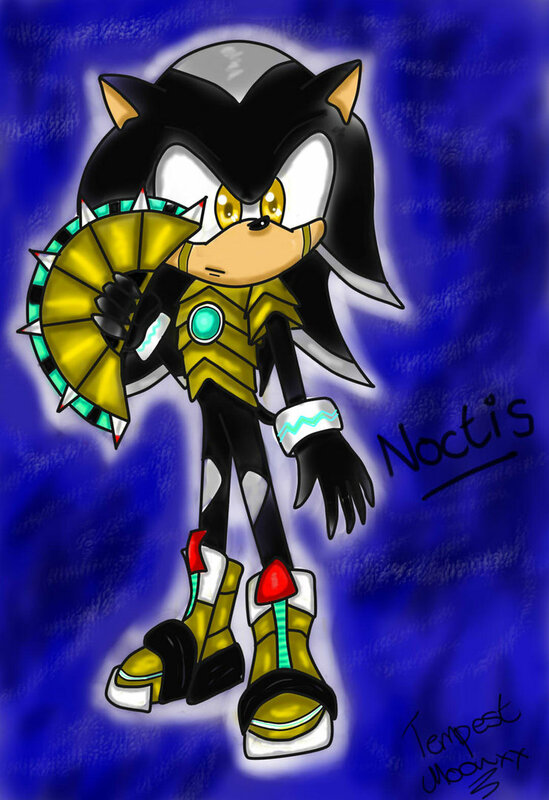 but this in noctis grew into bitter jealousy and almost hatred for the farm raised hedgehog to which the guardians chosen regulus to be their savior much to noctis's dismay but only by the celestial guardian Amaterasu noctis was giving a second chance to reunite the two clans of the nocturnus and knuckles clans whilst Regulus was sent to gather the allies of the north and the south. which for him was proven to be a hard task given his situation with his father ix. but only through the graces of the goddess aurora in time he managed to pull it off with the marriage of the daughter of the knuckles tribe tikal. whilst he did have a love struck crush on the echidna princess which led to their marriage their were some difficulties that nearly caused the marriage not to be like the in fighting between the two clans and the out right use of the water god chaos to nearly destroy them. it was thanks to tikal and noctis that their love could get their clans to make peace whilst the bigger threat was still out there. and so after many trials and tribulations both regulus and noctis set off on their task with many allies to face the fallen god and his allies. and once the battle raged and many lives were lost argus who was indeed quick and cunning torn a hole in the sky sucking everyone and everything in it as his finale gambit move. as everything was being sucked into the mysterious vortex the celestial guardians quickly moved to save their chosen warriors but before they could move argus enraged strikes out at regulus only to have noctis intrude on the attack and gets sucked into the vortex much to his wife's shock and horror. and with his heroic act regulus seals argus and his allies into the vortex with the sword the celestial guardians gave onto him. honoring the lost of his companion he gave him a statue in his honor and the people of mobius always will remember his sacifice. now many years later after being summoned from the twilight cage by dr. lyric he was sent by argus to collect the seven celestial gems and the sword of regulus to free argus from his dimensional prison but due to the aid of moonlight the hedgehog and leo the chimera he was freed and helped the two destroy argus for good and freeing the lost spirits that were trapped in the twilight cage. and now currently he lives on aurora island with his wife tikal who was given life once more due to dr. lyric's technology and echidnian ancient science.